But like anything good, it takes commitment. I’ll be the first to admit that I’m extremely susceptible to beauty-related FOMO. One of my friends debuts new lavender hair? I book an appointment immediately. A fellow editor swears by a yet-to-be-released hydrating mask? I’ve already pleaded with PR to send me a sample. Very rarely does my try-first-and-ask-questions-later approach not result in either a new favorite product or a valuable what-not-to-do lesson to share with other beauty junkies. So, after witnessing dozens of trusted makeup connoisseurs post Instagram stories with the ubiquitous jade roller for the past few months, I knew it was time to test one for myself (especially since my love of beauty tools is well documented). 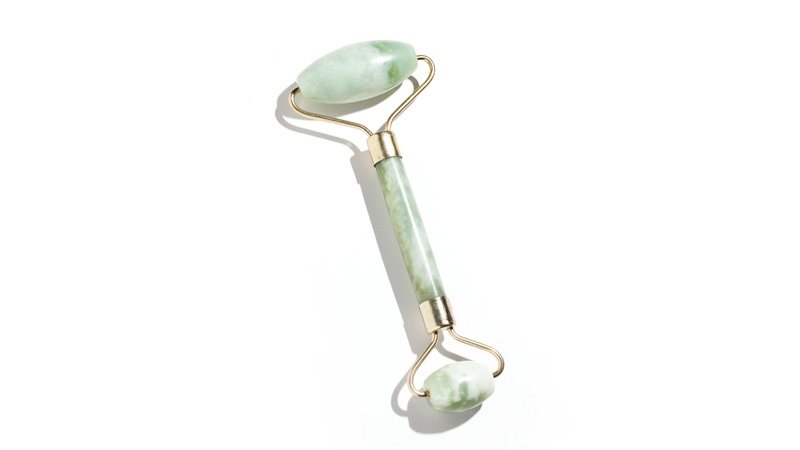 A few clicks on my Amazon Prime account later, and I was the proud new owner of a trendy jade roller. The only problem was I had no idea how to use it! The first morning I just swiped it up and down my cheeks and forehead, hoping for some heretofore unknown epidermal magic to take place. Clearly, I needed to learn to walk before I could roll. My technique, as in how to even use a jade roller, could still use a little work, so I consulted the team at natural beauty brand Herbivore Botanicals—who manufactures their own jade roller—for some tips. “Start at the center of the face—under the eyes and cheekbones—and work your way out to the hairline. Then move down to the jawline, again starting at the center of the chin and moving out along the jawbone. To end, roll from the bottom of the ear down the neck towards the center of the jawbone—this helps to drain all the lymph to the lymph nodes.” Again, lymphatic drainage (aka flushing your body of toxins) is the goal here. That means less puffy morning face and more well-rested Wonder Woman complexion. Both Wong and the Herbivore Botanicals team encouraged me to store the jade roller in the freezer overnight to help tighten the skin, combat swelling, and boost my overall glow. I also needn’t apply a ton of pressure, as the lymphatic system lies just beneath the skin. So with these tips in mind, I set off on a month’s worth of rolling, snapping selfies each day so I could track my progress. I’m not sure whether starting this experiment in December—the month when mindful eating goals wither and die—was my best idea, but I quickly began to take note of how *exceptionally* puffy my face becomes after a night of wine and pasta. I’d wake up bleary-eyed and alarmed that my cheekbones, which are usually one of my favorite features, had all but disappeared. Roller in hand, I tackled each section of my swollen face—once on freshly washed skin, and again later to help absorb my various serums and creams. Four minutes of lymphatic drainage later, my features began to rebound. I started stretching out the time I dedicated to rolling, massaging, and generally babying my face. I even slowly weaned myself off that second-glass-of-wine habit when I’m out with friends. Literal self-reflection for upwards of an hour each week, all in hopes of chiseling your bone structure into top form, tends to make you wary of over-indulgence. Overall, I’ve kept my jade roller within arm’s reach even after the month was up, and not just because it looks cute next to my perfume bottles. I can slather on moisturizer or eye cream in ten seconds flat, but spending a few extra minutes on my skin feels like a manageable degree of luxury. And my cheekbones have been on point ever since.